Rust begins as small yellow spots on leaves and stems that form elongated, reddish brown or orange pustules. Shoes and clothes are often stained orange by the spores when walking through infected lawn areas. Rust kills leaves and debilitates plants when it is severe. The turfgrass quality is reduced because of poor color and reduced plant vigor. Rust survives as dormant mycelia in infected plants and as teliospores; it may spread to turf from infections on other grasses and woody ornamentals. Rust infections first appear as yellow to brownish pustules about the size of pinheads on the underside of lower leaves on the plant. Shortly after pustule development larger yellow to orange spots with reddish centers develop on the upper surface of the leaves. Severe infection promotes the spread of pustules to the upper surface of the leaves as well as the stem and the green flower parts of the plant. Rust infection will spread very fast from leaf to leaf, killing more mature leaves and making the plant unsightly. Bluegrasses, ryegrasses, zoysiagrass, and tall fescue. Moderately warm, moist weather favors rust development. Moisture in the form of dew for 10 — 12 hours is sufficient for the spores to infect plants. Warm air temperatures (70° — 75°F) and extended periods of leaf wetness favor the development of the disease. The disease is more severe in turf deficient in nitrogen. The fungus survives the winter on leaves and stems that were infected during the growing season. The fungus can also survive on the plant. In the spring spores produced by the fungus are spread by air currents to young plants. In this way, new plants are infected year to year. The rust will quickly transfer from leaf to leaf and plant to plant. Rust can usually be managed with proper mowing, fertilizing, and irrigation practices for infected lawns. On other garden plants infected leaves should be removed, burned or disposed of in the trash as soon as they are noticed (do not put into the compost pile). Rust-infected stalks should be removed as soon as the plants are through blooming and destroyed with any leaves that have fallen. Dusting the plants with sulfur or spraying with fungicides will aid in controlling the disease. Many of the all-purpose garden sprays or dusts contain chemicals that will aid in the disease control. Dusting and spraying should begin early in the season making sure to keep new foliage covered with the spray or dust, especially the underside of the foliage. Providing good air circulation about the plants will lessen the chance of the disease spreading. This may necessitate thinning out some plants. To reduce the incidence of rust in lawns, maintain turfgrass vigor by applying adequate but not excessive nitrogen fertilization and irrigate in the morning according to the evapotranspiration needs of the turfgrass. Provide good air movement on surface of grass. Mow the turfgrass regularly and remove clippings if the lawn is infected to reduce the number of spores. Mixtures of several compatible turfgrass species fare better against rust than turfgrass composed of a single species. 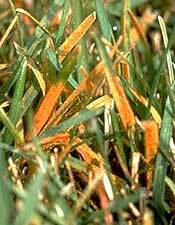 Most Kentucky bluegrass and tall fescue varieties are fairly resistant to rust. Rust can usually be managed successfully through cultural practices, but in severe cases fungicide applications can be made.